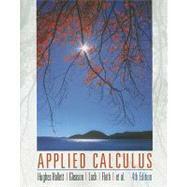 Applied Calculus: The fourth edition gives readers the skills to apply calculus on the job. It highlights the applications’ connection with real-world concerns. The problems take advantage of computers and graphing calculators to help them think mathematically. The applied exercises challenge them to apply the math they have learned in new ways. This develops their capacity for modeling in a way that the usual exercises patterned after similar solved examples cannot do. The material is also presented in a way to help business professionals decide when to use technology, which empowers them to learn what calculators/computers can and cannot do.